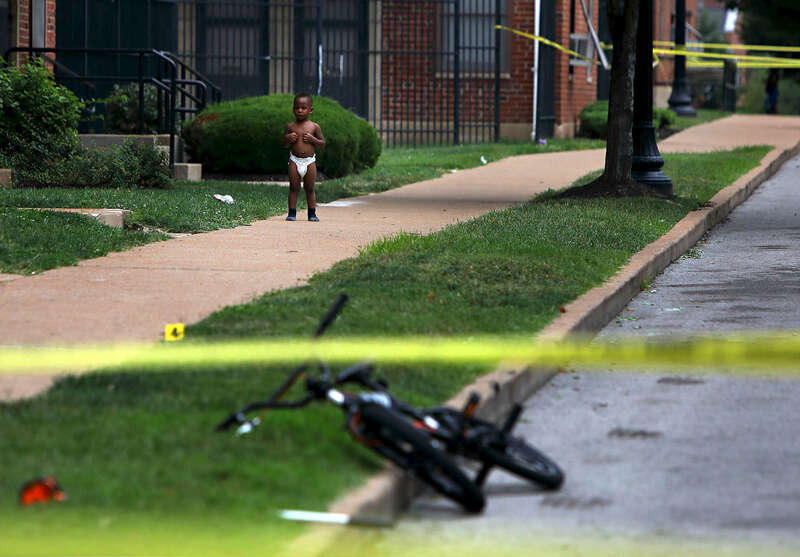 Toddler Donovan Allen, 2, stands outside his home in the 1100 block of Dillion Street as police investigate a fatal shooting in the 1400 block of Kealty Lane in St. Louis on Monday, Aug. 7, 2017. Donovan's mother, not pictured, was sitting on the front steps of her home to the left watching police investigate the scene. Police tape and evidence markers denoting bullet casings were put up right outside the front steps of the Allens home. It was the third fatal shooting in a month that occurred within 100 yards of Donovan's home. The suspect in the shooting returned to the scene driving a minivan and surrendered to police, who recovered a gun from the vehicle.